Advantage Multi for cats prevents parasite infections, fleas, heartworm, gastrointestinal worms, mites and lice. 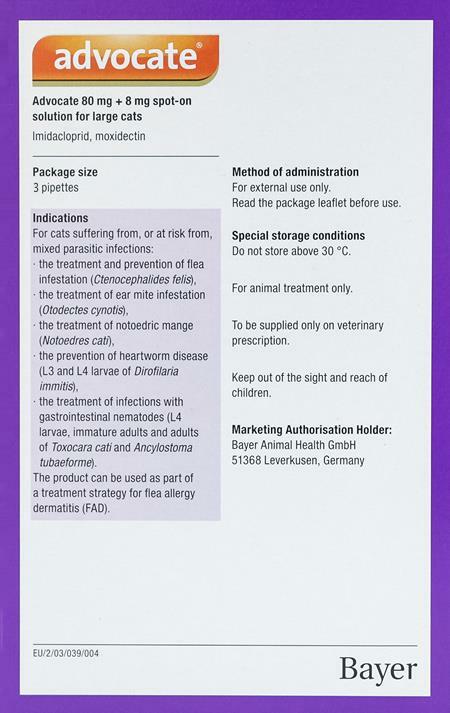 Not only is it an extremely effective agent of parasite destruction, but it’s delivered as an easy to administer topical cream, making it a convenient choice for cat lovers everywhere. This should be good enough for any cat who is bigger than 4kg - 8.5 lbs. There is no upper limit. However we always recommend to get advise from your vet before using any medication. is this Advantage Multi for Cats effective against round,hook, and whip worms? your ad says this is preventative against lungworm, heartworm, mites. i'm interested to know if against whip, hook and roundworms are included. will i need a different worming solution or tablet for Merri's tapeworm protection? the price is wight if the protection is really multi! How much is shipping to St. Martinville, LA 70582 for a "3" pack of Advantage Multi for cats over 8.8lbs? How is the product applied? Leaflet was not included. What is the difference between Advocate and Advantage (which is more expensive). Great product and great service with best prices ! The product I order...Advantage ,is working great on my cats. It did take nearly 3 weeks to come, but the savings was worth it.